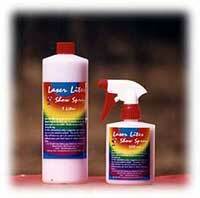 Laser Lites Show Spray has been formulated to produce the ultimate finish for the show ring. It contains an anti-static agent, as well as a coat polish. Simply spray on before entering the ring.